Kudang B. Seminar is a professor in the Department of Mechanical & Biosystem Engineering & the Computer Science Department, Bogor Agricultural University (IPB). 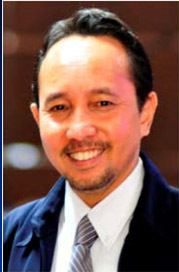 He was the president of and is currently is an honorary board member of Asian Federation for Information Technology in Agriculture (AFITA) http://www.afita.org/ and that of Indonesian Society of Agriculture Informatics (HIPI). He received his master and doctoral degrees in the field Computer Science at the University of Brunswick, Canada. His research interests include Digital & Smart Agriculture, Precision Agriculture, Traceability Systems, Knowledge Management System for Agriculture, Distributed Artificial Intelligent System (Multi-agent Systems). He is an author of national and international articles, a reviewer of International Agricultural Engineering Journal (IAEJ) and Journal of Biosystems Engineering. Currently, he is the Dean of Agricultural Engineering and Technology Faculty at Bogor Agricultural University (IPB).